Palawan Wildlife Rescue and Conservation Center or commonly called as the Crocodile Farm is home to a number of Philippine Crocodiles. The center is doing research on conserving and multiplying this endangered species. Upon entrance you will instantly noticed the skin of a big crocodile displayed on the wall. How big it must be when it was still alive!! There are many of this boxes around the center. These baby crocodiles are group together by age (number of days they've been hatched from the egg). Don't display or put your hands over these baby crocodiles because they love to jump. Moving past we reached the den of the bigger crocodiles. We we're on a bridge above them. Checked out my grandma's shoes with a crocodile below. This is how the bridge looks like. I remembered that my grandma is very nervous walking at this bridge. She's afraid the bigger crocodiles would jump and pull people from above. Apparently the much bigger ones are kept out of visitors. I've learnt that they are the aggressive ones too. Yikes! There are other animals inside the center to see too. Here's me and granda posing with the hanging plants at the background. Outside of the center there are stalls in which you are served with crocodile meat and some souvenirs. 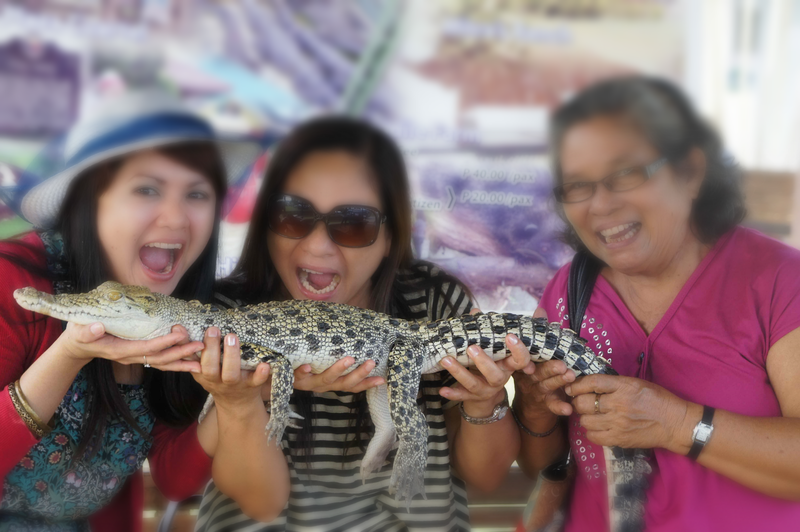 We took the opportunity to take a photo with a baby crocodile. Don't worry the mouth is sealed so it's safe. Sorry, I purposeful blurred this photo. Here are some stalls at the area. Noticed the big crocodile stuffed toys. And here's grandma looking out for souvenirs. OMG that skin thing is so big! Nice pics! I love animals this looks like so much fun.